A watch is a tool that a lot of nurses can make use of. But finding a watch for a nurse can be difficult as there are a few things we need to consider. The best watches for nurses should be waterproof, unobtrusive, and easy to read. Waterproof is important since nurses are constantly washing their hands. The watch should be unobtrusive and easily read allowing for efficiency during a long shift. Luckily for you, nurses, I’ve reviewed the top five good watches for nurses with these key features. I can’t wait to share them with you, so let’s begin. 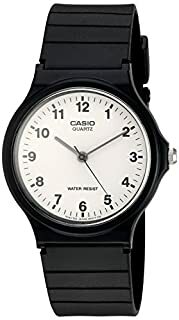 Coming in as the best watch for nurses is this classic watch from Casio. The low cost of this watch makes it an affordable choice. But don’t let the low price fool you into thinking this is a cheap investment. This watch has a large face with analog display making it easy to read by just a glance. The face remains scratch resistant so don’t worry about being gentle with it. The quartz sweep movement of the hands eliminates any annoying ticking sound that other watches may make. Nurses love how lightweight this watch is. Many forget it’s even there when not using it! The resin buckle-closure band is comfortable as well as cleanable. The only feature this seems to be missing is a glow-in-the-dark feature. If you’re often in a patient’s dark room, you may want to look at some of our next options. Otherwise, this is one of the best watches you can buy at an affordable price for practicality purposes. This watch from Timex is a classic-looking watch with a variety of colors to choose from allowing you some self-expression. The metallic case paired with the leather strap gives a clean look to the watch while keeping it comfortable. Water resistant up to 30 meters, you can take this watch with you in the shower if you wanted. The analog face is easy to read and unobtrusive in size. If you’re like me and enjoy a smaller, low-key yet still nice-looking watch, this is the one for you. Timex also added the Indiglo night-light, which is extremely useful in darker settings. All this at an affordable price as well as a 1-year limited manufacturer warranty, it’s hard to beat such a deal. As an owner of this watch, I can attest to all these features. This is a useful, practical watch that is there when you need it, and out of the way when you don’t. Another model from the ever-popular Casio brand, the Resin Casual Watch comes with a quartz movement analog display and elegant design. The same resin band with buckle closure is easily cleaned and maintained. The Arabic numeral indices and seconds hand helps to keep track of seconds, for say, checking a pulse. Nurses love the simple, classic design of the white dial against the black watch. 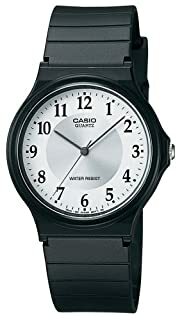 This is a no-frills-added practical watch with an easy-to-read face that’s a bit larger than the previous Timex model. Wash your hands as much as you want as this watch can withstand it. It’s important to note that this watch seems to be on the smaller side length-wise- around 35mm. For this reason, female nurses may be more apt to consider this option more than male nurses. The low price of this watch means most anyone could get it. You’d also be supporting the U.S. as Casio’s watches are all made in here. If you’re willing to pay a bit more, you could get this Baby G watch from Casio, which has features galore. This nursing watch has a digital face and is water resistant up to 200 meters, the most water resistant out of any in this list. A digital clock is arguably the easiest to read, as it is straightforward. The watch is on the larger, bulkier side but this helps with its shock resistant capability. Overall, this is simply a durable watch. Let’s talk about the features. You get a backlight with afterglow, five daily alarms, auto calendar, and a choice between 12-hour or 24-hour formats. A stopwatch is included, as well as a day counter, world time, and a 25pg databank with a memory capacity of up to 25 sets of data. Sound appealing? It should if you want everything conveniently placed on your wrist. Be warned that the white may get dirty, but if you take it in the shower with you, you should be able to clean it easily. Lastly, we have the Prestige Medical Women’s Cyber Gel Watch. From the name of this watch, you can tell it was made for a nurse. An obtrusive, solid design makes this a practical choice, and for a low price. What I like most about this watch is the addition of 24-hour time under the analog numbers. This is useful for nurses in the military, or for those who simply prefer 24-hour time. The face is clear and easy to read, although some say that the numbers are small to see. The casing is water resistant and the gel band is comfortable around the wrist. There are screws on the back of the watch that are not flush against its surface, which may dig into your wrists. Some find it uncomfortable, others do not mind it. Like the first option, there is no backlight added to this watch. Nurses enjoy the color options, though, from pink to purple or black. You could even match it with your favorite shoes and scrubs for nurses. A simple, or not-so-simple, wrist watch can help make your day go by smoother. Any of these options of watches could improve your efficiency and help you get your job done in a clear manner. Look out for those key features, and think about what you need from your watch. If you’re like me and think simplicity is key, you may go for the first or second option from this list. 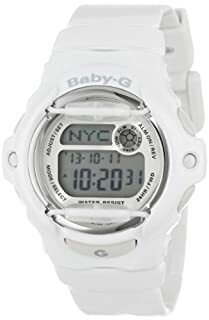 If you expect for your watch to stand up to anything and provide you with important tracking details, you may be a Baby G person. Whatever the case, your perfect watch isn’t so far away anymore. Happy watch hunting!